The outstanding Brother Innov-IS 550 Special Edition takes your sewing and creativity to another level. With a raft of built-in stitches and useful features this premium computerised sewing machine will revolutionise your sewing. Ideal for fashion work and quilting, this exceptional machine will surprise and delight. 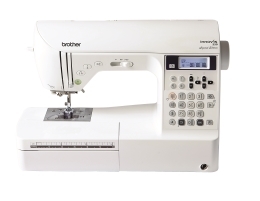 The Brother Innov-IS 550SE features a fabulous 429 built-in stitches for you to choose from. With utility, decorative and quilting stitches at your disposal you can sew whatever your imagination conjures. There are 10 styles of automatic one step buttonhole and you can create even more stitch choices using the mirror function. The stitch reference panel makes it easy to find the stitch you need and you are guaranteed a professional finish with Brother’s fine stitch quality. You will also benefit from My Custom Stitch which enables you to create your own stich patterns. You can then save these to the memory. With the 7 piece feed dog and presser foot levelling you can smoothly feed a variety of fabrics. Whether you wish to work with fine sheers or heavy denims, this machine makes sewing easy. You can start sewing quickly thanks to the automatic needle threader and the automatic reverse facility provides a secure and tidy finish to every row. This machine also offers a top loading bobbin with see-through cover, a built in thread cutter, speed control and a start/stop function so you can work without using the foot controller. The needle up down facility means that you select where your needle finishes to make life easier when you need to pivot at corners. With a drop feed facility for free hand sewing and a knee lift so you can always keep both hands on your work, this machine really has it all. The Brother Innov-IS 550SE is the machine that will truly enhance your sewing experience. It opens up limitless possibilities so you can achieve amazing results. My Custom Stitch for creating your own stitch designs. Mirror Imaging of your Stitch Pattern to give even more Stitch Variety.